Just a reminder that Live Nation is waiving the service fee on lawn tickets to a bunch of outdoor amphitheatre concerts today, starting at 12:01 am in your local time zone. Bands include The Killers, Nine Inch Nails and Jane’s Addiction, and Depeche Mode. Wired has the full list. 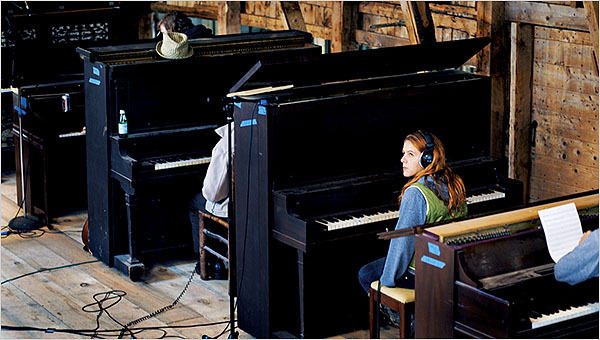 A long profile of Neko Case in last Sunday’s New York Times Magazine. The best part, for those of us obsessed with infographics, is this interactive map with samples of her solo music and work with The New Pornographers, The Corn Sisters, and more. If you’re interested in the direction that music and the music industry is going, and you’re not already reading it, I highly recommend Music Think Tank. The postings are typically thought-provoking and knowledgeable. Speaking of music blogs, Boston’s own Ryan Spaulding, of Ryan’s Smashing Life, was interviewed for this LA Weekly article about disappearing posts on music blogs hosted by Blogger. It’s certainly starting to look like Google (who acquired Blogger in 2003) might be violating its ‘don’t be evil‘ policy by eschewing takedown notices in lieu of simply deleting posts without warning. Ryan makes a morally compelling argument: “By pulling down my post, they destroyed my intellectual creativity, the very same thing they’re erroneously accusing me of doing.” (‘erroneously,’ because, like many music bloggers, he is posting MP3s at the behest of the same record companies who are presumably putting pressure on Blogger to remove posts). You can read Ryan’s own post on the topic here. As of yesterday morning, Ticketmaster and Live Nation announced that they’d merge into a single entity, with the caveat that the merger is still subject to regulatory approval. If you’re a legislator or a civil servant who’ll be involved in deciding whether the new entity will violate anti-trust laws, you probably know about about the concerns with Ticketmaster and its in-house secondary market, TicketsNow (if not, you can ask Bruce Springsteen). And you should be alerted by phrases like ‘the creation of an entertainment powerhouse of game-changing proportions‘ or ‘the most powerful and influential entity the music business has ever known‘ appearing in news stories about the merger. But what I really suggest you do is the following: Take a look at the concert listings for your city, and choose an artist that you would like to see. Then go to the Ticketmaster website and ‘buy’ tickets for the concert. Here’s my test run: I picked The Killers, playing at the WaMu Center in Seattle on April 22nd. The face value of each ticket was $33, and after I selected ‘2’ as the number of tickets, I got the first of the additional charges: $9.70 x 2 and $2 x 2 in ‘convenience’ and ‘building’ fees (can’t they do the arithmetic and give me the total charge?). Then I chose their ‘recommended’ delivery method, a PDF of the tickets – apparently it costs them $2.50 to send me an e-mail that I have to print out myself (maybe they could get some hints from the airlines). Next, I logged into an existing account, but if you haven’t bought tickets from Ticketmaster before (lucky you! ), you have to create an account. After investing all of that time in the purchase, I got an extra little surprise: $5.35 in ‘processing’ charges. 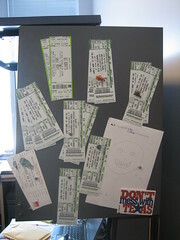 Final tally: $97.25 for $66 worth of tickets, or a markup of 47% on each ticket. Needless to say, I didn’t push the ‘submit order’ button. If you went through that process, especially for a band you do want to see, you probably feel like you’ve been held up by your ankles and shaken repeatedly to dislodge all the money from your pockets. So ask yourself this: is this the behavior of a company that is vying with its competitors? Or is it the behavior of a company whose business model is predicated on maximizing what the buyer is willing to endure? Ticketmaster already has a monopoly, if not over all live music, then certainly over a large chunk of artists and venues. Live Nation is the same. Given their current behavior, do we really want to allow them to join forces extend their de facto monopolies even further? There is no way this merger is good for the consumer. Please do the right thing and refuse to approve it. UPDATE: Less than a day later, and the Justice Department has already announced that it will scrutinize the merger; the investigation may take up to six months.